David Bonotto, finance manager at Shaheen Chevrolet in Lansing, Mich., points to a local news article about potholes and damages. He sells customers a five-year tire-and-wheel policy for about $300. Says Bonotto: "Not only do I have the materials, but I show them the local roads and talk about the concerns people are expressing." At Liberty Honda a damaged wheel holds Nate Sisco's office door open. He uses it to close sales of tire-and-wheel protection policies. "It works great," says Sisco, the Hartford, Conn., store's business manager. "People think it's the coolest looking door stopper and say, 'What's that for?' I explain to them that the person it belonged to had to leave their wheel behind." Most likely, the person hit a pothole that destroyed it, Sisco adds. Finance and insurance professionals say sales of tire-and-wheel protection policies were higher in the first few months of 2014 than they were in 2013 as motorists contended this year with roads ravaged by one of the coldest, snowiest and iciest winters on record. It's spring now, but many F&I managers hope to keep the tire-and-wheel sales momentum going. "We have good F&I managers who are very resourceful," said Dave Duncan, president of Safe-Guard Products International, an F&I product provider in Atlanta. "I have F&I managers who have charts on their desks that show how a pothole is formed. Or a mason jar on their desk with nails, screws and glass that they pulled out of tires." Duncan added that a couple of F&I managers have laminated an article from The Wall Street Journal about the pothole problem to show to customers. Liberty Honda's Nate Sisco: "We're in New England. People don't forget the winters in New England." Potholes start when water seeps into small holes and cracks in pavement. When the water freezes, it expands, pushing the pavement upward. Traffic stresses the raised pavement. When the ice thaws, it leaves a cavity below the pavement. When vehicles drive over the cavity, the pavement breaks and falls in, forming a pothole. Potholes could cost American motorists nearly $6.4 billion this year in repairs to tires, wheels and suspension components, according to AAA Mid-Atlantic. Duncan says Safe-Guard settled more than 25,000 tire-and-wheel claims in February, up about 30 percent from February 2013. Severe weather and potholes caused the damage in about half of those claims, he says. Larry Dorfman, CEO of F&I administrator EasyCare, says sales of tire-and-wheel policies are up in 2014 compared with the first few months of last year. While he says he can't conclude the increase in policy sales can be attributed solely to the harsh winter, he says he expects an increase this year in weather-related claims. "We will definitely have higher claims in spring due to the damage done to the roads from the winter weather," Dorfman wrote in an e-mail to Automotive News. "This would give the F&I manager a great presentation to discuss starting now on every customer." Shaheen Chevrolet in Lansing, Mich., sells about 3,000 new and used vehicles a year. 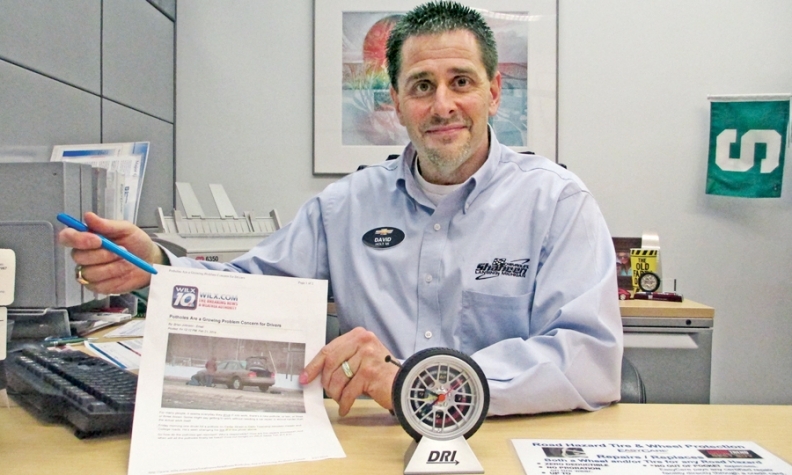 In March 42 percent of the store's vehicle buyers bought a tire-and-wheel policy, says President Ralph Shaheen. While he can't provide a 2013 number for comparison, he says sales of the product are rising. "We don't have to sell it, the media is selling it for us," Shaheen said. "Just do a pothole story." 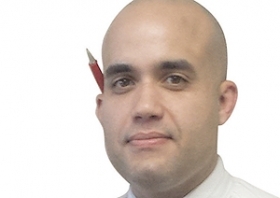 David Bonotto, Shaheen's finance manager, sells a five-year tire-and-wheel policy for about $300. Without a policy, repairing or replacing a tire or wheel could cost $270 to $1,200, depending on the vehicle and the damage, he says. "I just recently pulled an article from [the news] a few weeks ago discussing potholes and damages," Bonotto says. "Not only do I have the materials, but I show them the local roads and talk about the concerns people are expressing." Bonotto hopes to keep the store's tire-and-wheel momentum going. Product penetration typically drops to about 25 percent of vehicle sales in the summer, he says. This year, as the weather warms, he plans to keep showing customers his news articles, reminding them of what winter brings, he says. Liberty Honda has seen an upswing in tire-and-wheel policy sales too. The dealership sells about 1,900 new and used cars a year. In February its penetration rate on tire-and-wheel policies rose to 68 percent of vehicle sales, up 18 percent from the year-earlier month. Penetration rose even though the store sold fewer vehicles this February year over year, Sisco says. In March the dealership's overall penetration rate was 55 percent, up only 1 percent from the year-earlier period. But Sisco says his own penetration rate on the policies rose 9 percent, to 66 percent of the customers he handled, because he used the weather and road conditions as a closer. And Sisco isn't worried tire-and-wheel policy sales at the Connecticut store will wane as summer nears. "We're in New England. People don't forget the winters in New England," he says. "I just remind them of that and that there is other debris on the road. People remember nails. I remind them it's as simple as that. If you're driving 60 or 70 mph, that nail is going to be like a blade to that tire and rip it to shreds." Then he points to the prop holding open his door.